In addition to saving you time and money, frozen sandwiches make for easy grab-and-go lunches when you need them. Whether they're leftovers from takeout or sandwiches you made specifically to be frozen, it's hard to beat their convenience. Whether it is frozen or kept in the refrigerator overnight, an Italian beef sandwich can be reheated and enjoyed when you're ready. Heated properly, this sandwich can be enjoyed as if it were freshly made. Allow the frozen Italian beef sandwich to thaw in the refrigerator for three to four hours. 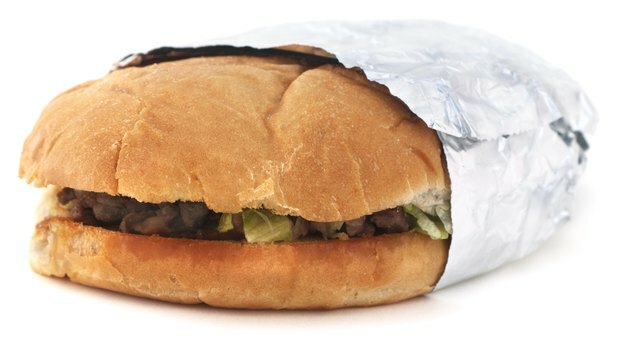 Wrap the sandwich in aluminum foil; the foil should cover the entire sandwich. Place the sandwich on a baking sheet or oven-safe pan and place it into the oven. Warm the sandwich at 325 degrees Fahrenheit for 15 to 20 minutes. Remove the sandwich from the oven and pull back the foil to inspect it. If areas are still cold, it can go back into the oven for two to three minutes more. You can also heat the sandwich in the microwave for two to three minutes; cover it with a piece of wax paper. Check the sandwich after each minute to avoid heating it too long. As sandwiches heated in the microwave may be soggy or chewy, heating them in a convection oven is optimal.